We all knew there would be a Puss in Boots movie the second the image of Puss with his giant cute eyes became a computer desktop background months before Shrek 2: Dark Territory hit theaters. And while the Shrek series has been on a rocketship to planet Crap, Puss in Boots manages to be more entertaining than any Shrek sequel. And I’m not just saying that because I liked the film and saw it for free at an advanced screening. In fact, I had a bad time at the theater until the film started, thanks to some awful customer service that guaranteed I’ll never buy concessions there again. But the humor was good enough to calm my nerves and even get me happy again. Puss in Boots is a spinoff of the Shrek films, but manages to feel somewhat independent of the Shrek universe while still being a part of it. There are still fairy tale elements running around, but the desert environments, Mexican flavor, and wild west inspiration give us a different spin. We follow our familiar character, Puss in Boots, as he has a prequel adventure that is both a story of its own and an origin story (done in flashback.) The decision to not make it a direct origin story, but to start from a familiar place and then go backwards before heading forwards was the right one. We already like Puss in Boots, and don’t need to be sold on liking him. The flashback to his childhood instead is plot related, making it feel important and not just filler. Puss in Boots (Antonio Banderas) – Our title kitty is the solo hero this time out. And gives us some much-needed awesomeness on full throttle. Puss in Boots was always awesome, and he’s still awesome when the spotlight is shone on him. Kitty Softpaws (Salma Hayek) – The famous feline thief you may have heard of, but if you haven’t, it’s only because she’s robbed your memory. The greatest thief eve becomes the love interest for our feature. Humpty Dumpty (Zach Galifianakis) – Puss’s old pal who turned to a life of crime and roped Puss into it. Now reformed, he’s trying to recruit Puss into one last big score, robbing the goose that lays the golden eggs. As we start, Puss is attempting to steal magic beans from notorious outlaws Jack and Jill in order to pay off his lone debt. But his theft is thwarted when another cat thief (in a costume resembling Batman) also attempts to steal the magic beans, alerting the criminal duo to the feline larcenists. Puss chases the mysterious other cat, gets involved in a dance battle, and recruited by his childhood friend Humpty Dumpty on a big score to steal the magic beans and use them to grow a beanstalk to rob the goose that lays the golden eggs. This matter is complicated because Puss and Humpty Dumpty had a falling out last they met, that resulted in Humpty spending years in prison and Puss a fugitive in his hometown. Their bad blood is put aside, because Puss can use the money to pay off his debt to the people of his hometown. The plot itself is rather generic, but generic in a good way. There is little of the subversive elements that helped make Shrek stand out from the fairy tales it was lampooning (and later sadly turned into), but we don’t really want a complete carbon copy. Puss in Boots isn’t Shrek, it’s Puss in Boots. That fat green lump and the chatty donkey aren’t even mentioned, which is totally awesome. It’s probably the best part about Puss in Boots that isn’t cat related. There are still jokes that only adults will get, along with the simpler humor for the kids. And the product placement is much more toned down (either that, or I’m starting to get blind to it!) The 3D is nice (as most CGI films have), but not essential for the experience. You would be perfectly fine if you skip it. I couldn’t help notice there were a few similarities to Shrek 2, including an extended bar sequence filled with shady characters, and a giant monster during the climax. But besides a few elements, Puss in Boots largely stands in his own shoes. Or boots. And does it well. Let’s not forget that Puss in Boots had an all-cat premiere! HOLLYWOOD, CA (October 6, 2011) – Tinseltown’s most touted Tabbies and Toms traipsed the red carpet last night—occasionally stopping to scratch or chase something sparkly before attending a special screening of the DreamWorks Animation SKG, Inc (Nasdaq: DWA) October 28th release, “Puss in Boots.” Headlining the event was the suave and sophisticated Spaniard himself, Antonio Banderas, who has supplied the voice of the legendary hero since Puss’ first onscreen appearance in the global hit, “Shrek 2,” in 2004. 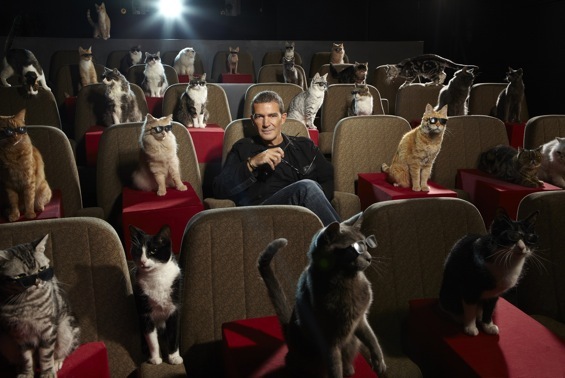 The “felines only” unspooling on the lot of Paramount Pictures brought the crème de la crème of industry kitties before the kliegs, including such breed standards as Cat Blanchett, Don Cheetah, Leonardo di Catrio, Zach Galifurnakis, the Real Housecats of Beverly Hills, Kitty Perry, and Justin Timberlynx. “It was a purrfectly enjoyable event—I’m so glad I got up from my nap in time to make it,” one attendee was overheard saying. DreamWorks Animation’s “Puss in Boots” bounds its way into theatres nationwide on Friday, October 28, 2011. “Puss in Boots” has been rated “PG” for some adventure action and mild rude humor by the MPAA. So are you on a kick with starting your reviews, “We all knew”? Anyway, Banderas is always fun, so I’m looking forward to doing this as a double bill with The Skin I Live In. Charles Perrault must be rolling in his grave to see how dare did DreamWorks turned his beloved feline hero into a Zorro wannabe how brutal and disgusting and of course this Puss In Boots ruined the Shrek franchise also get that idea in your head! I think the Shrek franchise ruined the Shrek franchise, as the films morphed into the very thing the original Shrek mocked. It’s like when you grow up and realize you are your dad.